So why is the Cann Office called the Cann Office? Here are some of the explanations for this unusually named hotel. Cann Office was apparently so named in 1795, but had been known for three centuries before as “Caen-y-Foss” and before that as “Tyn y Domen Blowty”. The name is derived from the adjacent “Hen Domen and Foss” (the pre-historic Earth-works) out of which the Inn has grown. Cann Office was the capital of Blowty Ville and in the late 13th century belonged to Don John de la Pole, a younger son of Griffith, prince of Powys. The first tenant whose name appears in 1310 is “Madoc ap Owen de Blowty” under whose tenancy the “Can” or local brew which had first been brewed here in the late 1200s became popular. As Cann Office is halfway house between Mathavaran and Dolorddun (two bivouacs of Henry Tudor on his way to Bosworth) it is only reasonable to believe that the future King of England stopped here on August 10th 1485. At the rear of this Hotel lay the remains of an ancient motte and bailey castle. Half of the motte, which was originally surmounted by a wooden structure, has long since been removed to allow the hotel to be extended. When it was complete the motte, or mounds was probably about 90 feet in diameter at the base tapering to about 25 feet in diameter at the summit. It stood in a rectangular bailey measuring some 115 feet from east to west and some 100 feet from north to south. The surrounding ditch has been filled in. After the wooden castle had disappeared a farmhouse was subsequently erected in the bailey area and called “Tynydomen” (The House in the Bailey). On 26th August 1650 Tynydomen was leased to David Watkin of Blowty township in Llangadfan parish. In olden days when the King or a Baron or Bishop wanted to send a message to someone else, the only way of doing so was by messenger on horseback, so the houses of important people often had several messengers with horses available in readiness. Then horses of course could not cover enormous distances and frequent changes of horses were therefore necessary. King Edward I (1272-1307) therefore established stations or “posta” in different places where horses for hiring were kept ready for the use of messengers. King Henry VIII (1509-1547) established a more permanent arrangement about 1516 when he appointed a “Master of the Posts” to supervise the services provided on the main roads out of London, which were known as the “Post Roads”. Since the established “posts” were very often located at inns, the innkeeper frequently became the “Post Master” and his inn a “Post Office”. It is difficult to say when the post came to Mid-Wales, but it is fairly certain that a service was available through the Banw Valley by the middle of the 17th century, by which time it is not unlikely that there was some sort of inn on the site of this hotel. In 1677 a survey of the area noted the “Horse Posts” on the road from Aberdyfi to Shrewsbury were located at Machynlleth, Taendomine (i.e. Tynydomen) and Welshpool. Although the Cann Office first occurs in 1662 in an account written by the well know Quaker, Richard Davies, the name of Tynydomen continued to be used in official leases of the building. For a long time the origin of this new came “Cann Office” has been obscure. A Victorian rector of Llangadfan suggested that it was a corruption of “Cae yn y floss” (an enclosure within a ditch) but this has never been regarded as sound etymology. It is clear therefore, the Tynydomen and Cann Office are one and the same place; that the inn which stood here used an inn sign (required to be shown by law by every innkeeper) of three cans (or drinking vessels); and that it was also a “Post Office”. Hence the name Cann Office. Some maps and early guides give the alternatives of Canns Office, Can Office or Cannon Office. All mean the same thing – “cannon” or “canon” was the land name for a tall tankard. 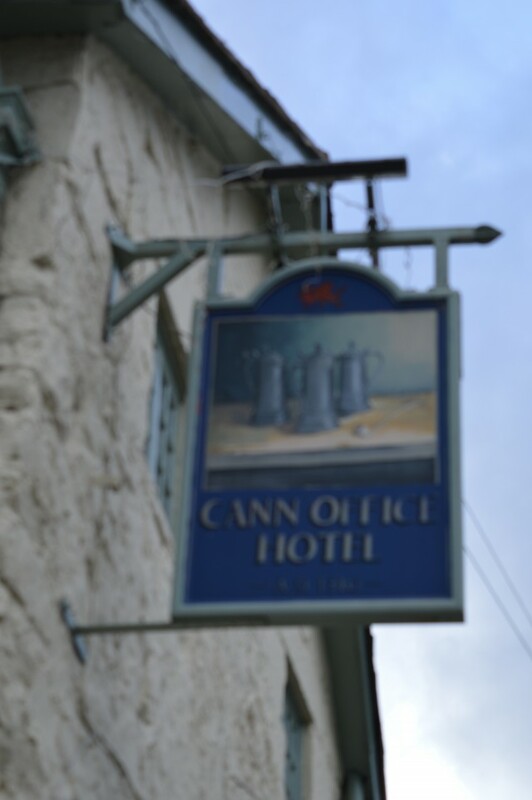 The original inn sign showing 3 canns, or 3 tankards full of local brew, gave a clear message to passers by that the building was an inn since the majority of ordinary people would have illiterate at the time the inn first traded. The current sign still shows 3 canns, but hotel no longer helps to deliver the post!